Amélie Simone Mauresmo (French pronunciation: ​ [ameli simɔn moʁɛsmo] ; born 5 July 1979) is a French former professional tennis player, and former world No. 1. Mauresmo won two Grand Slam singles titles at the Australian Open and at Wimbledon, and also won a Silver Medal at the 2004 Summer Olympics. The 2006 Australian Open was played between 16 and 29 January 2006. Mauresmo was inducted into the International Tennis Hall of Fame in 2015. 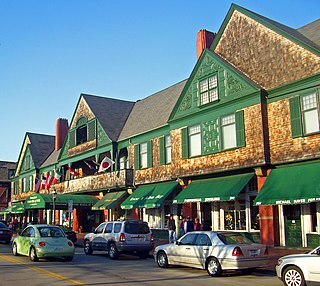 The International Tennis Hall of Fame is located in Newport, Rhode Island, United States. It honors players and contributors to the sport of tennis and includes a museum, grass tennis courts, an indoor tennis facility, and a court tennis facility. Mauresmo was born in Saint-Germain-en-Laye, slightly northwest of Paris. She began playing tennis at the age of four, after being inspired by Yannick Noah's win in the 1983 French Open on television. It was after his win that Mauresmo's parents bought her her first tennis racket. Later on in 1998 Yannick Noah picked her on the French team for the Fed Cup. Her mother Françoise is a housewife and her father Francis, who died in March 2004, was an engineer. She has a brother, Fabien, who is an engineer. Saint-Germain-en-Laye is a commune in the Yvelines department in the Île-de-France in north-central France. It is located in the western suburbs of Paris, 19.1 km (11.9 mi) from the centre of Paris. Yannick Noah is a former professional tennis player and singer from France. He won the French Open in 1983, and is currently the captain of both France's Davis Cup and Fed Cup team. During his career, which spanned almost two decades, Noah captured a total of 23 singles titles and 16 doubles titles, reaching a career-high singles ranking of World No. 3 and attaining the World No. 1 doubles ranking the following month. Since his retirement from the game, Noah has remained in the public eye as a popular music performer and as the co-founder, with his mother, of a charity organization for underprivileged children. Noah is also the father of Joakim Noah of the NBA Memphis Grizzlies. The 1996 French Open was a tennis tournament that took place on the outdoor clay courts at the Stade Roland Garros in Paris, France. The tournament was held from 27 May until 9 June. It was the 100th staging of the French Open, and the second Grand Slam tennis event of 1996. The 1996 Wimbledon Championships was a tennis tournament played on grass courts at the All England Lawn Tennis and Croquet Club in Wimbledon, London in England. It was the 110th edition of the Wimbledon Championships and was held from 24 June to 7 July 1996. The 1999 Australian Open was a tennis tournament played on outdoor hard courts at Melbourne Park in Melbourne, Australia. It was the 87th edition of the Australian Open and was held from 18 through 31 January 1999. This was the first Grand Slam of the calendar year. Total attendance for the event reached 391,504. Lindsay Ann Davenport Leach is an American former professional tennis player. She was ranked World No. 1 on eight different occasions, for a total of 98 weeks. Davenport is one of five women who have been the year-end World No. 1 at least four times since 1975; the others are Chris Evert, Steffi Graf, Martina Navratilova and Serena Williams. She has achieved the No. 1 ranking in doubles as well. Martina Hingis is a Swiss former professional tennis player. She spent a total of 209 weeks as the singles world No. 1 and 90 weeks as doubles world No. 1, holding both No. 1 rankings simultaneously for 29 weeks. She won five Grand Slam singles titles, thirteen Grand Slam women's doubles titles, winning a calendar-year doubles Grand Slam in 1998, and seven Grand Slam mixed doubles titles; for a combined total of twenty-five major titles. In addition, she won the season-ending WTA Finals two times in singles and three times in doubles, and an Olympic silver medal. Mauresmo reached the semifinals at Wimbledon, where she lost to Serena Williams in three sets after winning the first set and up a break in the second set. She reached the quarterfinals of the three other Grand Slam tournaments and won three Tier I titles in Rome, Berlin, and Montreal. On 13 September 2004, Mauresmo became the first French tennis player to become world no. 1 since the computer rankings began in the 1970s. She held that ranking for five weeks and was the second woman, after Kim Clijsters, to have attained the top spot without having won a Grand Slam title. Mauresmo reached the quarter-finals of the Australian Open, but was defeated there by eventual champion Serena Williams. At the US Open, Mauresmo lost in the quarter-finals to Mary Pierce in straight sets. That followed a semi-final loss to Lindsay Davenport at Wimbledon. Mauresmo claimed her first singles title at the WTA Tour Championships. She defeated Pierce in the final after losing to Pierce in a round-robin match at that tournament, in three sets. At the Qatar Total Open in Doha, Mauresmo defeated Martina Hingis in a semifinal, 6–2, 6–2, but lost to Nadia Petrova in the final. Had she won the final, she would have immediately regained the world no. 1 ranking from Clijsters. Nonetheless, the outcome was sufficient to ensure Mauresmo's return to the world no. 1 ranking on 20 March 2006. Mauresmo lost in the fourth round of the French Open to Czech teenager Nicole Vaidišová, 6–7(5–7), 6–1, 6–2. Mauresmo next suffered a first-round loss at the Wimbledon warm-up tournament in Eastbourne. However, Mauresmo and Kuznetsova won the doubles title there, their first as a team and Mauresmo's second overall. Mauresmo was the top seed at Wimbledon. She defeated Anastasia Myskina in a quarterfinal and Maria Sharapova in a semifinal, and then came back from one set down to defeat Henin in the final 2-6, 6-3, 6-4. The victory was Mauresmo's second Grand Slam singles title and the first on grass. She was also the first Frenchwoman since Suzanne Lenglen to win Wimbledon.The two finalists played an amazing serve and volley style of play in the final coming to the net many times.The Wimbledon final was notable because it was the first and the only time in the decade neither Williams sister's qualified for the Final. Her next tournament was the Pilot Pen Tennis tournament in New Haven, Connecticut, where she lost in the quarterfinals to Lindsay Davenport, 4–6, 5–7. Mauresmo then reached the final of the China Open, losing to Kuznetsova. During the tournament, Mauresmo won 137 ranking points to help preserve her world no. 1 ranking and ended a nine-match losing streak to Davenport stretching back to January 2000 in Sydney. To conclude the year, Mauresmo reached the final of the WTA Tour Championships in Madrid, losing to Henin, 4–6, 3–6. Mauresmo finished the year ranked world no. 3, behind Henin and Sharapova. Mauresmo started the year in Australia with a quarterfinal loss to Jelena Janković at the tournament in Sydney. At the Australian Open, Mauresmo lost in the fourth round to Lucie Šafářová, 4–6, 3–6, after winning her first three matches in straight sets. Mauresmo's next tournament was the Open Gaz de France, where she lost in the semifinals to Nadia Petrova, 7–5, 4–6, 6–7(7), after Mauresmo led 4–1 in the final set and had a match point in the tiebreak. This was Mauresmo's third loss in the last four matches with Petrova. 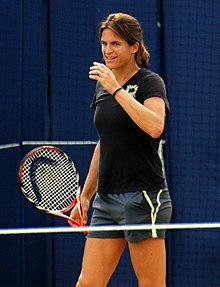 In her next tournament at the Proximus Diamond Games in Antwerp, Belgium, Mauresmo defeated Kim Clijsters in the final. This was Mauresmo's third consecutive title there, earning her the diamond-encrusted racquet that comes with winning the title at least three times in five years. The trophy cost US$1.3 million. Mauresmo then played the Dubai Duty Free Women's Open, where she lost to Justine Henin in the final. On 16 March 2007, Mauresmo received the Chevalier of the Légion d'honneur from President Jacques Chirac. Mauresmo was scheduled to play the Sony Ericsson Open in Key Biscayne, Florida, but was forced to withdraw because of acute appendicitis. She also withdrew from the Bausch & Lomb Championships in Amelia Island, Florida for the same reason. Although she had resumed training, she was not fit enough to compete at the J & S Cup in Warsaw, Poland. At the Qatar Telecom German Open in Berlin, Mauresmo lost in the third round to Julia Vakulenko of Ukraine, and at the Internazionali d'Italia in Rome, she lost in the second round to Australian Samantha Stosur, 7–5, 7–6(4), 6–7(7), after Mauresmo led 5–3 in the third set. Going into the French Open, Mauresmo had played only three tournaments since the end of February. Mauresmo lost to Czech Lucie Šafářová in the third round, 3–6, 6–7(4), committing eight double faults and 49 unforced errors. After losing to Henin in the final of the International Women's Open in Eastbourne, 5–7, 7–6(4), 6–7(2), after being up 4–1 in the deciding set, defending champion Mauresmo went into Wimbledon saying that she was ready to win another major title. However, she lost her fourth round match against Czech teen Nicole Vaidišová, 6–7(6), 6–4, 1–6. The loss dropped her to world no. 6, her first time outside the top five since November 2003. Mauresmo withdrew from the last Grand Slam tournament of the year, the US Open, because of a lack of fitness. She made her return to the tour at the China Open in Beijing. However, she lost in the quarterfinals to home-crowd favourite Peng Shuai. She then entered the Porsche Tennis Grand Prix, where she lost to Elena Dementieva in straight sets. At the Kremlin Cup in Moscow, Mauresmo lost in the first round to Vera Zvonareva. In Zürich, Mauresmo lost in the second round to Alona Bondarenko in three sets. Mauresmo left Dunlop for HEAD racquets. The partnership was to run through 2010. Her first tournament of the year was the Tier III Mondial Australian Women's Hardcourts in Gold Coast, Australia, where she lost in the quarterfinals to fourth-seeded Patty Schnyder. At the Australian Open in Melbourne, Mauresmo lost in the third round to Australian Casey Dellacqua, 6–3, 4–6, 4–6. At her next tournament, the Tier II Open Gaz de France in Paris, Mauresmo lost in the quarterfinals to Anna Chakvetadze,6–3, 3–6, 3–6. Mauresmo played both tournaments in the Middle East. At the Tier I Qatar Total Open in Doha, she lost in the second round to Tamarine Tanasugarn, 6–7(7), 5–7. At the Tier II Barclays Dubai Tennis Championships, Mauresmo reached her third quarterfinal of the year, but was unable to hold off second seed and eventual finalist Svetlana Kuznetsova, losing 1–6, 6–7. Mauresmo then lost in the third round of Tier I events, the Pacific Life Open in Indian Wells, California and the Sony Ericsson Open in Key Biscayne, Florida. At the French Open, Mauresmo lost in the second round to a Spanish qualifier, Carla Suárez Navarro, 3–6, 4–6. At the International Women's Open in Eastbourne, United Kingdom, Mauresmo defeated sixth-seeded French woman Alizé Cornet in the first round, 6–1, 4–6, 7–5, but lost in the second round after retiring due to injury from her match with Australian Samantha Stosur while Mauresmo was leading 2–1. Mauresmo, after a two-month hiatus from tennis due to a thigh injury sustained at Wimbledon, lost in the semifinals of the Western & Southern Financial Group Women's Open in Cincinnati, Ohio to Nathalie Dechy, 4–6, 6–3, 2–6. After the match, Mauresmo, sounding optimistic about her chances at the upcoming US Open, said "I got four matches in this week, which is what I was looking for. It would have been great to play five but I'll go to New Haven (Connecticut) hoping to find a little more rhythm and build up to the US Open." Mauresmo then lost in the semifinals of the Pilot Pen Tennis tournament (in New Haven) to top-seeded Chakvetadze 6–3, 3–6, 6–1. At the US Open, Mauresmo lost in the fourth round to 16th-seeded Flavia Pennetta 6–3, 6–0. Mauresmo lost in the first round at Tokyo and Beijing, both times in long three-set defeats by Dominika Cibulková. She reached the second round in Moscow, falling to Dinara Safina, 7–6(2), 4–6, 4–6, and fell in the first round at Zurich to Belarusian teenager Victoria Azarenka. She ended her year with a quarterfinal result at Luxembourg, losing to eventual champion Elena Dementieva. Mauresmo ended the year ranked world no. 24, with a singles record of 32–19. Mauresmo at the Brisbane International tournament in 2009. At the Brisbane International tournament, Mauresmo defeated world no. 177 Jelena Dokić in the first round, 7–6(9), 7–6(5), before defeating French compatriot Julie Coin in the second round, 5–7, 6–2, 7–6(11) in 3 hours, 14 minutes. The fifth-seeded Mauresmo then defeated top-seeded Ana Ivanovic in the quarterfinals, 6–3, 6–2, before retiring in her semifinal match against third-seeded Frenchwoman, Marion Bartoli, while trailing 0–4 in the first set. At the Australian Open, Mauresmo lost in the third round to Victoria Azarenka. Mauresmo lost in the third round of the BNP Paribas Open in Indian Wells, California, the first Premier Mandatory event of the year, to Li Na, 5–7, 2–6. The next event on the WTA tour was another Premier Mandatory tournament, the Sony Ericsson Open in Key Biscayne, Florida. Mauresmo was seeded 20th there and lost in the fourth round to unseeded Australian Samantha Stosur, 4–6, 4–6, but ended up winning the doubles event with her tennis partner Svetlana Kuznetsova, after ousting the world champions on their way to the cup. At the Madrid Masters, Mauresmo defeated Zheng Jie in the second round, 6–2, 7–5. She then came from behind to defeat Elena Dementieva, 1–6, 6–4, 6–2, and Ágnes Szávay, 5–7, 6–1, 6–1, in the third round and quarterfinal respectively. She lost against fast-rising teenager star Caroline Wozniacki, 6–7(1) 3–6, in the semifinals. Mauresmo lost against Anna-Lena Grönefeld, 4–6, 3–6, in the first round of the French Open. Mauresmo was the 17th seed at the 2009 Wimbledon Championships. She opened with a 6–1, 4–6, 6–2 win over Melinda Czink. She then defeated Kristína Kučová and Flavia Pennetta. Her fourth round match against the first seed Dinara Safina became a part of tennis history as it was the first competitive match in which the new, multimillion-pound roof closed due to rain. Mauresmo went on to lose the match, 6–4, 3–6, 4–6. At the 2009 US Open, Mauresmo was the 17th seed, but lost to unseeded Aleksandra Wozniak, 4–6, 0–6, in the second round. In June and July 2010, Mauresmo temporarily coached fellow French player Michaël Llodra during the grass season. On 7 November, Mauresmo ran her first marathon at the 2010 New York City Marathon, finishing 3hr: 40m: 20s. At the 2011 French Open, Mauresmo was set to be reunited with Llodra, making her professional return in the mixed doubles competition, but was disqualified before competing, as she had not re-registered for the anti-doping procedures required to compete on the tour. In 2012, Mauresmo joined forces with 2012 Australian Open Champion and then-World No.1 Victoria Azarenka and her team as a support coach to help the Belarusian in defending her World No. 1 ranking and launching an assault on the remaining three Grand Slams of 2012 and the 2012 Olympics. French Fed Cup team: 1998–99, 2001–05. Justine Henin, between 2002 and 2007 Justine Hénin-Hardenne, is a Belgian former professional tennis player known for her all-court style of play and notably being one of the few female players to use a single-handed backhand. She spent a total of 117 weeks as the world No. 1 and was the year-end No. 1 in 2003, 2006 and 2007. Henin, coming from a country with limited success in men's or women's tennis, helped established Belgium as a leading force in women's tennis and led the country to its first Fed Cup crown in 2001. Jennifer Maria Capriati is an American former professional tennis player. A member of the International Tennis Hall of Fame, she won three singles championships in Grand Slam tournaments, was the gold medalist at the 1992 Summer Olympics, reached the World No. 1 ranking, and is considered one of the greatest tennis players of all time. Nadezhda Viktorovna Petrova is a Russian former professional tennis player. Mary Pierce is a retired tennis professional. She represented France internationally in team competitions and in the Olympics. The 2005 WTA Tour was the elite professional tennis circuit organized by the Women's Tennis Association (WTA) for the 2005 tennis season. The 2005 WTA Tour included the four Grand Slam tournaments, the WTA Tour Championships and the WTA Tier I, Tier II, Tier III, Tier IV and Tier V events. ITF tournaments were not part of the WTA Tour, although they award points for the WTA World Ranking. Tatiana Golovin is a Russian-born French retired professional tennis player. She won the 2004 French Open mixed-doubles event, partnering with Richard Gasquet, and reached the singles quarterfinals at the 2006 US Open, losing to the eventual champion Maria Sharapova. Her career-high singles ranking is world No. 12. In 2008, she was diagnosed with lower back inflammation and was forced to stop playing competitive tennis indefinitely. Nicole Vaidišová is a former professional tennis player from the Czech Republic. Marion Bartoli is a French former professional tennis player. She won the 2013 Wimbledon Championships singles title after previously being runner-up in 2007, and was a semifinalist at the 2011 French Open. She also won eight Women's Tennis Association singles and three doubles titles. She announced her immediate retirement from professional tennis on 14 August 2013. Francesca Schiavone is a former Italian tennis player who turned professional in 1998. She won the 2010 French Open singles title, becoming the first Italian woman to win a Grand Slam event in singles. She was also runner-up at the 2011 French Open. Her career-high ranking is world No. 4, achieved on 31 January 2011. To date, Schiavone is the last one-handed-backhand player to win a Grand Slam title on the women's tour. Maria Sharapova was the defending champion, but lost to Venus Williams in the semifinals. Vera Yevgenyevna Dushevina is a retired Russian tennis player. She was born in Moscow and now resides in nearby satellite city of Khimki. Serena Williams was the defending champion, but she was defeated in the third round by Daniela Hantuchová. The 2006 Wimbledon Championships was a tennis tournament played on grass courts at the All England Lawn Tennis and Croquet Club in Wimbledon, London in England. It was the 120th edition of the Wimbledon Championships and were held from 26 June to 9 July 2006. It was the third Grand Slam tennis event of the year. The 2007 Sony Ericsson WTA Tour was the elite professional tennis circuit organized by the Women's Tennis Association (WTA) for the 2007 tennis season. The calendar comprises the Grand Slam tournaments, the WTA Tier I-IV Events, the Fed Cup and the year-end championships. The 2004 WTA Tour was the elite professional tennis circuit organized by the Women's Tennis Association (WTA) for the 2004 season. The 2004 WTA Tour calendar comprised the Grand Slam tournaments, the WTA Tier I-V Events, the Fed Cup, the Summer Olympic Games and the year-end championships. Carla Suárez Navarro is a Spanish professional tennis player. She began playing for Spain in the 2008 Fed Cup. On February 29, 2016, she reached her career high ranking of world No. 6. Elena Viacheslavovna Dementieva is a Russian former professional tennis player. She won the singles gold medal at the 2008 Olympics in Beijing, having previously won the silver medal at the 2000 Olympics in Sydney. She won 16 WTA singles titles, reached the finals of the 2004 French Open and 2004 US Open and reached seven other Grand Slam semifinals. Dementieva was also part of the Russian team that won the 2005 Fed Cup. In doubles, she won the 2002 WTA Championship doubles with Janette Husárová and was the runner-up in two US Open doubles finals – in 2002 with Husárová and in 2005 with Flavia Pennetta. Dementieva achieved a career-high ranking of world No. 3, which was accomplished on 6 April 2009. She announced her retirement on 29 October 2010, after her final match at the 2010 WTA Tour Championships. Dementieva ended her career ranked world No. 9 and between 2003 and 2010 she only ended one year, in 2007, outside the top 10. Jelena Janković is a Serbian professional tennis player. Janković is a former World No. 1 in singles, a ranking achieved preceding her finals appearance at the 2008 US Open. Janković has won 15 WTA singles titles and two doubles titles, her career highlights include winning the 2007 Wimbledon Mixed Doubles title with Jamie Murray, the 2010 Indian Wells Masters, the Internazionali BNL d'Italia twice, in 2007 and 2008, and the aforementioned appearance in the finals of the 2008 US Open. She is coached by her brother Marko. Svetlana Aleksandrovna Kuznetsova is a Russian professional tennis player. She has appeared in four Grand Slam singles finals, winning two, and has also appeared in seven doubles finals, winning twice. As a doubles player, Kuznetsova has reached the finals of each Grand Slam event at least once, winning the Australian Open twice. ↑ "Serbian starlet shocks Mauresmo". BBC News. 28 May 2005. Retrieved 15 September 2012. ↑ "Sharapova stops No. 1 Mauresmo, will meet Henin-Hardenne in U.S. Open final". Usatoday.com. 8 September 2006. Retrieved 4 June 2012. ↑ Cheese, Caroline (27 June 2008). "Battling Serena sees off Mauresmo". BBC News. Retrieved 4 June 2012. ↑ "French stars to miss the Olympics". BBC Sport. BBC. 21 July 2008. Archived from the original on 22 July 2008. Retrieved 22 July 2008. ↑ "Mauresmo's title hopes ended by Dechy in Cincinnati". Uk.reuters.com. 17 August 2008. Retrieved 4 June 2012. ↑ "Amelie Mauresmo splits from coach Loic Courteau". The Daily Telegraph (Sydney) . Agence France-Presse. 30 September 2008. Retrieved 14 November 2010. ↑ "Women's singles results". BBC News. 26 June 2007. ↑ "Mauresmo calls time on her career". BBC News. 3 December 2009. Retrieved 23 April 2010. ↑ Hodgkinson, By Mark. "Amelie Mauresmo retires from tennis". ↑ Nguyen, Courtney (14 February 2013). "Marion Bartoli splits with father-coach, wants Amelie Mauresmo as replacement". Sports Illustrated. Retrieved 10 September 2014. ↑ "Amelie Mauresmo combines Andy Murray & Fed Cup roles". 2 December 2014 – via www.bbc.co.uk. ↑ Grez, Matias (9 May 2016). "Andy Murray and coach Amelie Mauresmo 'mutually agree' to end partnership". CNN. Retrieved 23 May 2016. ↑ "Amelie Mauresmo steps down as France's Fed Cup captain". tennis.com. Associated Press. 14 November 2016. ↑ "Amelie Mauresmo withdraws as France Davis Cup captain to coach Lucas Pouille". BBC . 6 December 2018. ↑ "Australian Open 2019: Lucas Pouille praises coach Amelie Mauresmo". BBC . 23 January 2019. ↑ Robson, Douglas (27 August 2006). "Mauresmo's stock can rise, fall in NYC". Usatoday.com. Retrieved 4 June 2012. ↑ Crawford, Harriet (9 April 2015). "Andy Murray's coach Amelie Mauresmo announces pregnancy on Twitter: 'Baby will be here in August'". Daily Mail. Retrieved 30 June 2015. 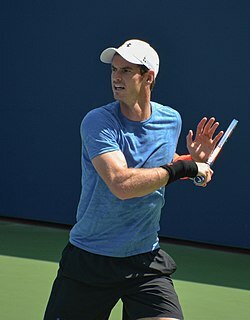 ↑ "Andy Murray: Scot dedicates win to new Mum Amelie Mauresmo". CNN. 17 August 2015. ↑ Tennis.com (17 August 2015). "Mauresmo gives birth to first child, a boy". ↑ "Amelie Mauresmo announces birth of second child". ESPN.com. 26 April 2017. ↑ "What they're wearing (and hitting with) at Wimbledon". SportsBusiness Journal. 25 June 2001. Retrieved 10 September 2014. 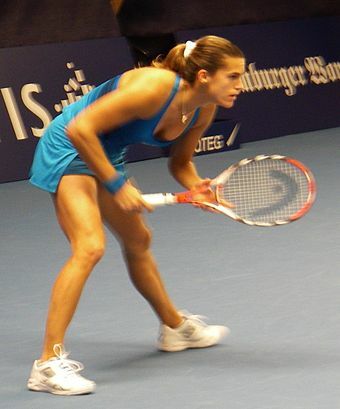 Wikimedia Commons has media related to Amélie Mauresmo .